A cannon ball is shot from ground level towards a target. Its initial velocity is v0 = 125 m/s at an angle θ = 37 degrees with the horizontal. Neglect air resistance. (a) What are the horizontal and vertical components of the initial velocity? (b) What is the maximum height of the cannonball? How long does it take to reach this height? (c) How long does it take to hit the ground? When it does so, what is its horizontal distance from its starting point? (d) What are its height and its horizontal displacement after it has been in the air for 10 s? What is its velocity (magnitude and direction) after it has been in the air for 10 s? We have motion with constant acceleration. (a) v0 = 125 m/s, θ = 37 degrees. vx(0) = v0cosθ = 99.8 m/s ~100 m/s, vy(0) = v0sinθ = 75.2 m/s ~ 75 m/s. (b) vy(tmax-height) = vy(0) - gtmax-height = 0, tmaxheight = 7.7 s.
vy(t)2 = vy(0)2 - 2gy, vy(0)2 = 2gymax, ymax = 287 m.
(c) Time to hit ground = 2*7.7s = 15.4 s. Distance = v0cosθ*15.4 s = 1540 m.
(d) y(10 s) = 260 m, x(10 s) = 1000 m.
vx(10 s) = 100 m/s, vy(10 s) = -23 m/s, v = (vx2 + vy2)½ = 102.6 m/s. tanθ = vy/vx, θ ~ -13o. Two trucks are parked back to back in opposite directions on a straight, horizontal road. The trucks quickly accelerate simultaneously to 3.0 m/s in opposite directions and maintain these velocities. When the backs of the trucks are 20 meters apart, a boy in the back of one truck throws a stone at an angle of 40 degrees above the horizontal at the other truck. How fast must he throw, relative to the truck, if the stone is to just land in the back of the other truck? The stone's motion is motion in two dimensions with constant acceleration. Put the origin of the coordinate system at the back of the parked trucks and let the boy be in the truck moving into the negative x direction. When each truck has moved 10 m, is speed is v = 3 m/s. Let v be the speed of the stone relative to the truck. The x-component of the stone's speed with respect to the ground is vx = v cos40o - 3 m/s. The y-component of the stone's speed with respect to the ground is vy = v sin40o. vxt = 20 m + (3 m/s)t. 0 = vyt - ½gt2, t = 2vy/g. 2vxvy/g = 20 m + (3 m/s) 2vy/g. vxvy = g 10 m + (3 m/s) vy. (v cos40o - 3 m/s) v sin40o = g 10 m + (3 m/s) v sin40o. v2 cos40o sin40o = g 10 m + (6 m/s) v sin40o. v2 = 199 (m/s)2 + 7.83 (m/s) v.
A player tossed a ball at some angle relative to the horizon. The maximum speed of the ball during the flight was 12 m/sec and the minimum speed was 6 m/sec. What was the maximum height of the ball during the flight? Please neglect air resistance. The ball executes projectile motion. vy = v0sinθ0 - gt, y = v0sinθ0t - ½gt2. vmax = v0 = 12 m/s and vmin = v0cosθ0 = 6 m/s. Therefore cosθ0 = ½, θ0 = 60o. tmax_height = vy0/g = v0sinθ0/g. 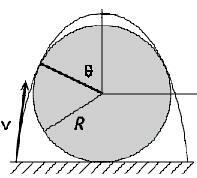 ymax = ½(v0sinθ0)2/g = 5.5 m.
A rock is launched from the ground level at a speed v directed at an angle θ with the horizontal. It is noticed that some (unknown) time t after the launch, the distance between the rock and the launch point begins to decrease. (a) Find the smallest launch angle θ consistent with this observation. (b) Find t, neglecting the air resistance. The rock is a projectile. For projectile motion we have x = v cosθ t, y = v sinθ t - ½gt2. (a) The distance between the rock and the launch point is D = (x2 + y2)½ = (v2t2 + g2t4/4 - vgt3sinθ)½.
dD2/dt = t(g2t2 - 3vgt sinθ + 2v2) = 0.
t2 - 3(v/g) sinθ t + 2v2/g2 = 0, t = [3v/(2g)][sinθ ± (sin2θ - 8/9)½]. If sin2θ > 8/9 or θ > 70.5287o, then two extrema exist. The figure below shows a plot of D versus t for v = 10 m/s and a launch angle smaller, equal, or greater than the critical angle θ > 70.5287o. The smallest launch angle θ consistent with the observation is just greater than 70.5287o. t > t2 = [3v/(2g)][sinθ + (sin2θ - 8/9)½] it increases again. The rock hits the ground at t = 2vsinθ/g. Two points, A and B, are located on the ground a certain distance d apart. Two rocks are launched simultaneously from points A and B, with equal speeds but at different angles. Each rock lands at the launch point of the other. Knowing that one of the rocks is launched at an angle θ0 > 45o, find the minimum distance between the rocks during the flight in terms of d and θ0? We have to find the position of both rocks as a function of time. The range of a projectile launched with speed v0 at an angle θ0 with respect to the horizontal x-axis is d = v02sin(2θ0)/g. For two projectile launched with the same speed v0 to have the same range they have to be launched at angles θ± = π/4 ± θ.
θ+ = θ0 = π/4 + θ towards point B. Let the origin of the coordinate system be at point A, let the x-axis point towards B and let the y-axis point upward. x1(t) = v0cos(π/4 + θ)t, y1(t) = v0sin(π/4 + θ)t - ½gt2. Assume rock 2 is thrown from point with speed v0 and launch angle θ- = π/4 - θ towards point A.
x2(t) = d - v0cos(π/4 - θ)t, y2(t) = v0sin(π/4 - θ)t - ½gt2. Let the distance between the rocks be L(t). = d2 + 2v02t2 - 4v0tdcos(π/4)cos(θ). dL2(t)/dt = 4v02t - 4v0dcos(π/4)cos(θ) = 0. L2(tmin) = d2 + d2cos2(θ) - 2d2cos2(θ) = d2 - d2cos2(θ). Lmin = dsin(θ) = dsin(θ0 - π/4) is the minimum distance between the rocks. A catapult set on the ground can launch a rock a maximum horizontal distance L. What would be the maximum horizontal launch distance if the catapult is set on a platform moving forward with constant speed equal to the launch speed of the rock? Neglect the air resistance and assume that the rock is launched from the ground level in both cases. The range of a projectile is R = (v02sin2θ0)/g. For the moving catapult: R = (v02sin2θ0)/g + v0t. t = 2vy/g = 2v0sinθ0/g. dR/dθ0 = 0 --> cos2θ0 = -cosθ0. θ0 = 600. Consider a lawn sprayer consisting of a spherical cap (α0 = 45o) provided with a large number of equal holes through which water is ejected with speed v0. The lawn is not evenly sprayed if the holes are evenly spaced. How must the number of holes per unit area, r(α), be chosen to achieve uniform spraying of a circular area? Assume the radius of the sprinkler cap is very much less than the radius of the area to be sprayed, and the surface of the cap is at the level of the lawn. The drops are projectiles. They execute motion in more than one dimension motion with constant acceleration. This acceleration is directed downward and has magnitude g.
A drop sprayed from an angle a travels a distance R(α). We want to find this range R in term of α.
R = x(t) = v0(sinα)t = v0(sinα)2v0(cosα)/g = v02(sin2α )/g. Drops sprayed from any angles between α and α + dα fall on an area 2πRdR between R and R + dR. The number of drops sprayed from angles between α and α + dα is proportional to ρ(α)2πr2capsin α dα. ρ(α ) is proportional to sin(4α) /sinα. system in the figure and neglecting friction, what are the particle's x- and y-coordinates when it hits the ground? Wall Height: zW = 8 ft; g = 32 ft/s2. The forces acting on the particle are gravity and the normal force of the roof. The motion in the xz plane is independent of the motion with constant vy in the y-direction. As long as the particle is in contact the roof: a = gsinθ. sinθ = 4/(160)½ = 0.316. For the motion to the edge of the roof: v1 = (2g zR)½ = 16 ft/s v1 = gsinθ t1, t1 = 1.58 s.
[Check that the particle stays on the roof during the time interval t1. The particle contacts the floor after an additional time t2. 8ft - v1zt2 - ½gt22 = 0 t2 = 0.568 s.
y = 3.16 ft + 2 ft/s (t2 - t1) = 4.3 ft. In a carnival game, you have to throw a ball with speed v0 at an angle θ in order to hit a target on the other side of the platform, located a distance h away. The platform is inclined at an angle φ. Find the angle θ in terms of the other variables. Orient the x and y axes of your coordinate system as shown. to the xy-plane is zero. In the x-y plane ax = 0, ay = -gsinφ = -g'. The range of the ball is h = (v02sin2θ)/g'. sin2θ = h gsinφ/v02, θ = ½ sin-1(h gsinφ/v02). A tree trunk lies on the ground. The trunk has a shape of a cylinder with radius R. A flea attempts to jump over the trunk. What is the minimum initial speed v that enables the flea to reach the other side? Assume that the flea is intelligent enough to select the optimal take-off point on the ground. (a) The flea is allowed to slide on the frictionless trunk. (b) The flea is not allowed to slide on the trunk and must clear the trunk. ½mv2 = 2mgR. The motion may be reversed. (b) The flea's trajectory must be a parabola as shown. (a) he flea must jump with a speed greater than v = 2(gR)½. (b) Let the parabolic arc of the flea be tangent to the trunk at an angle θ from the top of the trunk. The velocity of the flea at this point is vθ = (vθcosθ, vθsinθ). These give vθ2 = rg/cosθ. ½ mv2 = mg(r + r cosθ) + ½mrg/cosθ = mgr(1 + cosθ + 1/(2cosθ)). Minimizing this function of cosθ yields cosθ = 1/√2, θ = 45o. The minimum initial speed is v2 = 2gr(1 + √2), v = 2.197 (gr)½. A marble bounces down stairs in a regular manner, hitting each step at the same place and bouncing the same height above each step. The stair height equals its depth (tread = rise) and the coefficient of restitution ε is given. Find the necessary horizontal velocity and bounce height. (The coefficient of restitution is defined as ε = -vf/vi, where vf and vi are the vertical velocities just after and before the bounce. respectively). The horizontal component of the velocity of the marble, vh, is constant. Let vi and vf denote the magnitudes of the vertical components of the velocity of the marble just before and just after a bounce, respectively. Since the conditions at each step are exactly the same, vi and vf are also constants. The relationship between the magnitudes of v1 = vhi - vij and v2 = vhi + vfj is found from the conservation of mechanical energy in a conservative field. ½mv22 + mgl = ½mv12. v22 + 2gl = v12. vi2 - 2gl = vf2 = ε2vi2. vi2 = 2gl/(1 - ε2). What is the time between bounces? Starting with a vertical velocity vf, the time to reach the point where the vertical velocity is zero is t1 = vf/g. The time to accelerate downward from this point and reach a vertical velocity -vi is t2 = |vi|/g. The total time between bounces is t = t1 + t2 = (vf + |vi|)/g = l/vh, since during this time the marble has to cover a horizontal distance l.
vh = gl/(vf + |vi|) = gl/[(1 + ε)|vi|] = (gl/2)½[(1 - ε)/(1 + ε)]½. The bounce height h is found from conservation of energy. ½mvf2 = mgh, h = vf2/(2g) = ε2l/(1 - ε2). An plane, inclined at θ = 20o, touches a wall as shown in the picture. You drop a small, perfectly elastic ball from a height h = 1.5 m onto the onto the plane. The ball falls from rest. You do not move your hand. At what distance d from the wall do you have to drop it so that it bounces back into your hand? A wheel of radius b is rolling along a muddy road with a speed v. Particles of mud attached to the wheel are being continuously thrown off from all points of the wheel. If v2 > 2bg, where g is the acceleration of gravity, find the maximum height above the road attained by the mud, H = H(b,v,g).